What Is Divination and Soothsaying? What is the problem with working magic? As we come into this parsha we need to once again remember that the majority of this story is going to surround the actions of Balaam, and not Balak from whom this parsha is named. (see Parshat Balak 2011) The Torah expresses that he possessed some sort of prophetic abilities, even though it is quite obvious that he is not an Israelite. His gentile status is revealed in how he is astonished by Israel and considers them “the other” in his utterances. Though we are not sure exactly where he was from, early Torah translations and variations identify his land of Pethor as being in Ammon; this is north of Moab, being north of the Dead Sea and east of the Jordan River. This is supported by us finding verses here and in other places that further identify the area as Amon, and being in Mesopotamia; simply put, the present day Syria. The king of Moab sent for him in order to curse the camps of Israel. What we have to ask ourselves first is what type of prophet is this? How can we consider this person a prophet at all? We cannot deny that he had an ability to connect to the Divine because he even refers to G-d by His explicit name; Havayah – Hashem, the Ineffable Name of G-d (יהוה). He knew G-d well enough to understand who He was, and how wrong his involvement was all throughout the story and yet still goes along with the scheme. I would suggest that he possessed prophetic abilities, but that doesn’t necessarily make him a prophet. He had spiritual sensitivity, but was not in-tune enough to hear the voice of any moral conscience. He was driven more by greed than mysticism. At best all we can consider him some sort of mercenary prophet. In reality, he is really more of a magician than a prophet. Even then we must understand that by considering him a prophet we aren’t saying much about the quality of the individual or their abilities. A navi was always understood as more of being a person who speaks for an official purpose, generally regarding things that are of contemporary concern to the people whom they represent. In our scriptures we have other examples of people who were not morally right who experienced the state of navuah – the state of prophetic utterance; the officers of the evil King Saul and even the king himself were said to be overcome and immobilized by a state of prophecy when they were on their campaign of oppression and murder. (see 1 Samuel 19:18-24) Their appointed status seems to merit their spiritual experience, not their character. And so it is with Balaam. In fact there is nothing all that mystical about the word prophecy in Hebrew anyhow. Navuah is not magic. If we look at the roots for the word navuah we find that the scriptures reveal that its source word Niv means “sayings.” A Navi is just a person of official capacity that is good with words, so G-d utilizes them. (see Isaiah 57:19) They know how to entice people with the G-d-given ability to provide the sweetened fruit of their lips. and there is no soothsaying in Israel. In his observations about the spiritual practices of Israel he points out that there is no nachash in the descendants of Jacob, also called Israel. Generally we understand this to mean divination or sorcery. What this mean is to figure out something by use of omens, augury (observance of animal related omens) or spell-casting. 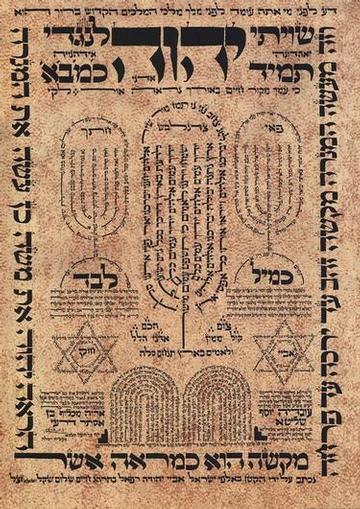 A nachash is a spell or enchantment. Actually enchantment (nachash; noun, masc.) is probably the best way of describing this in biblical terms. You see there is a drawn mental image that might explain the entomology of the word. Nachash (also a noun, masc.) is also understood to mean a snake as well. Charming snakes is one of the oldest tricks in the books. In the book of Exodus we see Moses’ rod turns into a nachash, a snake or viper (see Exodus 4:3). But this was so well achieved as a parlor trick that even Pharaoh’s magicians accomplished a similar feat with water-serpents (see Exodus 7:9), so they felt unimpressed. To us modern Hebrew speakers, an everyday and more common understanding isn’t so impressive for us either. We are less than impressed with the practice of nachash, as sorcery and enchantment. To nichesh (verb) is generally understood merely to mean to guess, to speculate, hypothesize and make conjecture. This is the cheesy side of magic. We generally see magic as a bunch of tricks and performance art. Modern people like us don’t see anything special about “magic.” Which we comely associate with the everyday word kesem, this is the more correct word when it comes to magic. To kosem means to captivate a person, to entice them, to allure them; thus when we call a person a kosem, we are calling them a magician but what we really mean is soothsayer because they are just using mysticism and spiritual tones to pacifying people. In purely secular terms the correct word for kesem would be illusionism. A kosem does things that seem impossible ordinarily, but have logical explanations for the phenomenon in the end. The skill of their “craft” was more dependent on being good at entertainment in the end. But there was some element of actual physical craft that was part of this of the kosem’s profession. A kosem in the biblical age was a person that someone went to for a physical form of divining, it was not something nearly as passive and suggestive as nachash. Kesem bares similar roots for many words that relate to cutting, specifically with the connotation of wood or fruit cutting. For this reason it is associated with wooden pieces used as lots for divining. So much so that in modern Hebrew keisamim means “toothpicks.” By reading the way they portioned themselves once cast one would decipher a person’s fate; in Arabic they still utilize a word for this, qismah to this day; from this is derived the Turkish word adopted into the English language for fate, kismet. The kosem wasn’t okay with just letting things be. Balaam was not willing to do any form of physical sorcery, it seems. But not everyone is so upright. Sure, Balaam was a wicked man by any measure. But he was only willing to go so far. Not everyone is so reserved when it comes to this. Naturally when one involves themselves in tapping into magical arts they often find themselves taking it to another level and try to change their presumed fate though witchcraft. This reality is driven home to us by the fact that the messengers of Balak seem to have expected him to resort to this. that they have any benefit. have been corrupted because of them. 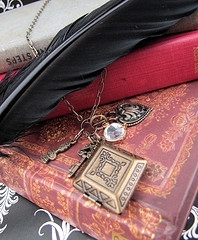 It is undeniable that our tradition forbids the use of charms and magical items. It is our goal to be unison with the seasons of blessing. We want to be on the same page as nature and G-d so that we don’t miss out. But we aren’t so foolish enough to think that we can change the order of the world to suit our own purposes. Anything that we hold as a charm is forbidden to us, we can’t warp the world nor should we warp our minds minds with such foolishness. that comes to tear him. of the Omnipresent [Heb. ha-Makom]. When the morning comes a Jew should be quick to rise in the morning with enthusiasm in order to take on their daily responsibilities. (see Tikkun Chatzot; and Modeh Ani) Sure we have ritual items, and we hold them so dear that as religious Jews that we start our day with taking upon ourselves the ritual-items of our faith. But we don’t do it for the protection of the items. We do it because they enable us to be able to meet our responsibilities of prayer and devotion; with the reciting of the Shema day and night. This is our avodah, our service and our work before Hashem, that we are to do as faithful people. These symbols of our faith are not charms, they are items that meant to help connect us to our spirituality and to the Torah; to help us get in touch with the consciousness of the Omnipresent. We don’t try to fight against G-d’s works and creation, instead we try to be in sync with it. We must keep in mind that our faith is not at all passive, but it does not allow us the possibility of believing we can change the universe and nature. We aren’t allowed the luxury of sympathetic magic in order to try to bring blessing and good fortune to us. What is the working principle and the distinction between the nations and Israel, as far as Balaam can see, is that they have the drive to go out and grab their fortune for themselves. Like a lion they get up with strength and eagerness to grab hold of what they desire, and don’t stop until they are satisfied. We don’t try to fight the Divine Will, nor try to mold it to our own shallow and short-sighted desires. Instead we engage ourselves in the works of Torah and mitzvot that are given to us by G-d. We engage in His works. And at the end of the day when we finally do lay down to rest we need not rely on our own strength or any type of magical power; instead we entrust ourselves to G-d and He does the work of protecting us. is called a Natla in the words of the Sages. I have to admit, this topic is one that is of such difficulty and can easily bring so much controversy regarding it that I have been very hesitant in approaching this next piece. But it is absolutely necessary to deal with this topic before we move on. I don’t want to debate out the controversies, but I do want to give explanation to the rituals of washing in context of the Nusach haAri z”l. This might differ in some respects from the normative traditions known by Ashkenazim and Sephardim alike as many personal customs and chumras have complicated how different communities approach this custom. I will present the simple and straight forward approach, relying on elements of practice and Jewish law taken from the urging of chachaimim (scholars) of both traditions. If we have slept at all unclothed one needs to wash. The reason is because the sages teach us that when we sleep a spirit of uncleanliness, an unenlightening consciousness comes over the body in the absence of our conscious self. According to the Zohar there is a residue of this unclean spirit that remains on the tips of the fingers that should removed by washing (Zohar, Vayishlach). For practical reason, this also is a good practice because one might have touched unclean parts of their body during the night, before touching any other parts of our body especially the orifices of the body, one should first wash. By washing one shows the immediate need to care for oneself, but also to approach our walk and practice before G-d with pure intentions. Based on this it is the Kabbalistic custom to not walk outside of ones reshut hayachid – their personal space, or own domain – without washing; the span of four amot (about 6-feet; or 2 – 2.3-meters). Washing is one of the most misunderstood of all the mitzvot (commandments). Most often the reason is because people misunderstand exactly why we are washing. This is because washing has had different applications at different points in history. And because there are different types of washing during the day. We need to look at both topics to understand which instance we are actually speaking about here. One of the earliest examples we have in the scriptures of ritual washing takes place in the context of the Mishkan – the Tabernacle sanctuary. Before the priests entered into the holy confines of the Temple complex to worship they would wash in the copper Lavern that stood inside the courtyard (see Exodus 30:17-21, 38:8). This ritual purification was as a sign of preparing oneself in order to worship. Likewise even sacrifices that were going to be offered on the altar were washed, washing serves as a symbol of preparing something for sacred use. Now there are other examples biblically of washing; washing for reason of impurity. This is the most often known reason, often enumerated in the mitzvot of Leviticus and Deuteronomy. When one is ritually unclean for some type of sin or affliction they are to wash their hands, wash his clothes, then bath and they are unclean for a certain amount of time (example, Leviticus 15:11). Because this topic comes up so often, it is often thought of as the only reason that people of the bible washed. People often associate all washing with removing illness and for reason of cleanliness. However, this is not the case here when we wash our hands in the morning. Simply put the biblical form of washing and bathing is to make someone ritually pure, to remove tumah that would prohibit them from being able to enter into the Holy Temple. 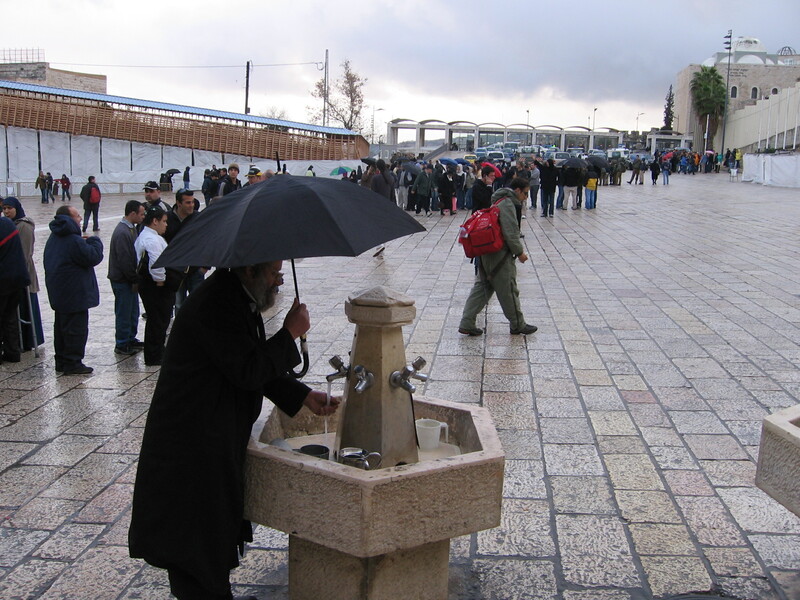 Since the Temple does not stand today, and we have no means of attaining true ritual purity through its rites, we are not concerned with ritual purity to the same extent (as we see this is a full washing of ones hands, feet and clothing; as well as full and complete ablution, immersion in a stream). All of us until the future Temple is rebuilt are in a state of general impurity, but as we don’t utilize the Temple rituals this is without consequence to us. Secondly, if we consider it, obviously a person that was subject to tumah impurity could not ascent to the Temple complex anyhow. Until they were pure again, no matter how many times they washed their hands, they could not go up into the sacred places until the days or even weeks of their quarantine passed. Thus the biblical washing in the courtyard is undoubtedly something all together different. | N’eki chapaim u-var leyvav. Our clean hands are symbols of our innocence, hands free of innocent blood and the stains of wrong doing. One of the reasons this washing in the morning is often misunderstood and people debate the practices related to it is because we don’t have a great deal of Talmud writing regarding this practice of morning washing. Though we will find extensive writing regarding the washings of the priests, the washing of sacrifices, immersions of vessels and people in the mikveh, and washing before and after meals; we will be left with a lot of ambiguity relating to morning washing. This would be something that would be dealt with in clarity by the later halachic writings from the Shulchan Aruch in the 16th century on, but this specific morning washing we are talking about is not a major rabbinic topic in Talmudic times. The most closely related form of washing from the Talmud, the example that stick out in peoples mind the most when it comes to ritual washing, is the use of yetilat yadayim – washing with a blessing for the elevation of the hands that is taken from the Talmud. Though there are different types of washing the one most people associate mentally with is washing with a blessing before a meal (in which bread is eaten). Though ritual washing would be an important topic about Judaism noticed by foreign cultures and religions, the broad practice of ritual washing was not established until well after the destruction of the Temple. Rituals which were reserved for the priesthood in the Temple era would be memorialized in everyday practice, reintroduces as spiritual practices that the whole community of Israel would participate in as early as the 3rd century CE. A lot of these symbols became things that would take place around the table, a symbolic altar. Just as the rabbis instituted the blessing and salting of bread in honor of the holy sacrifices that were salted, we wash our hands before a meal just as the priest washed before their sacrificial service. We wash to rise to a spiritual occasion, not to remove germs or physical impurity. Though one needs clean hands for netilat yadayim, the blessing of the hands, it does not purify the hands; it sanctifies them, prepares them for spiritual use. The blessing makes more sense to us if we use the modern Hebrew understanding of what it means to netilah; it means to take, to receive, to accept something. But it doesn’t mean to take just in the sense of merely obtaining something; it can also mean to accept responsibility. As we wash our hands with a blessing we are taking our hands and accepting upon them responsibility to do righteousness and holiness with these hands. The question that often arises for people when they are learning how to wash, is when do we say a blessing for washing. Some people assume that every time we wash, we say a blessing. This is not so. We wash with a blessing before a meal, because we are about to bless for eating. We are blessing in order to do a specific holy acts of blessing again over food and eating. However, when we awake in the morning the first thing that we as proper people should do is to ready ourselves for the day. That means getting dressing and cleaning up; washing our face, brushing our teeth, etc. However, remember, as I stated the kabbalists have taught us one should not touch any orifices of their body with unclean hands upon awaking because it can bring harm to us. Just as pious people do not walk four amot without a kippah (a yarmulke, a head covering) out of respect for G-d, pious Jews are of the practice of not walking more than four amot without washing to avoid harm. 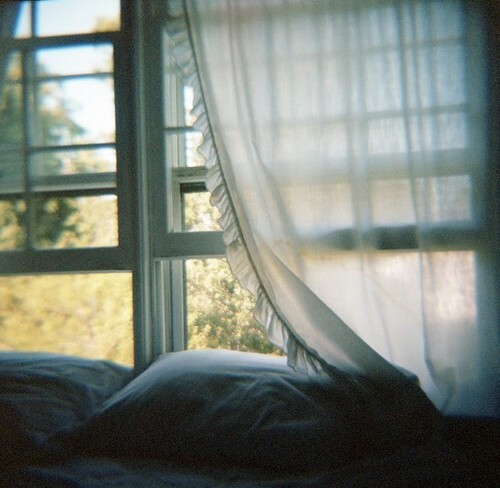 Though technically the rule of four amot can extend to the personal domain outside of one’s home, it is the practice of the pious to not walk more than four amot from their bed without washing. For this reason it is the custom of most Chassidim, and many Sephardim and mystics, to wash at the place one slept. Though one might reckon their reasons are for the purpose of being stringent in regard to the distance of four amot, the true impulse to doing so lies behind the spirit of the devout to not delay in doing a mitzvah. We should jump to perform a mitzvah as soon as we can, not putting it off. In enthusiasm to start doing works of holiness the pious make practice to wash at their bedside. Now when one washed at their bedside, they do not need to recite the blessing of netilat yadayim, as they are not going to going to engage in any specific holy act immediately. 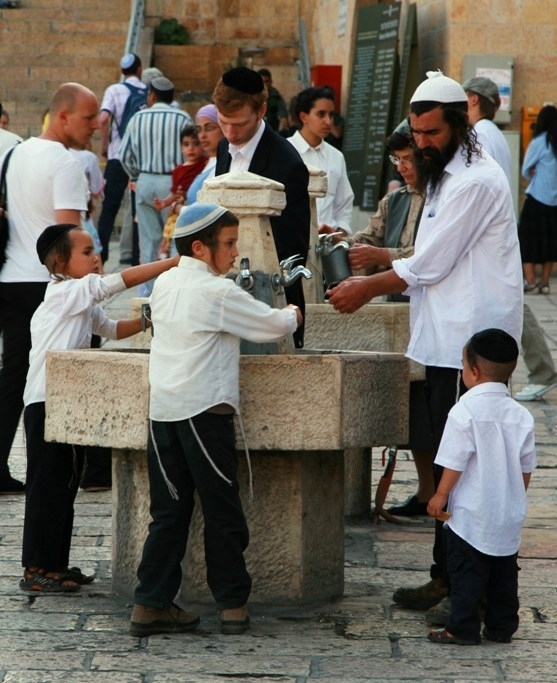 In fact it is preferred by our rabbis that one merely wash to remove the spirit of impurity from ones hands; pouring clean water from a vessel over one hands, first the right then the left, alternating three times back and forth. 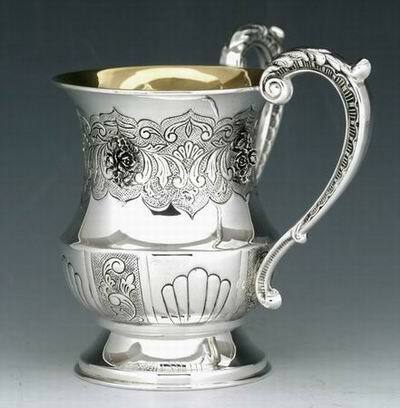 The water should be allowed to flow into a bowl or basin, and disposed of in a place where one does not intended to walk; this impure water is specifically what we call negel vasser in Yiddish (lit. “nail water”), meaning dead and impure water. Now that ones hands are clean they may go about washing and doing all their daily activities. We do not say a blessing because we are going to engage in our mundane activities. We reserve the blessing of netilat yadayim for after we are finished arising, specifically after we have evacuated our bowels by going to the restroom and after saying the appropriate blessing of asher yatzar, we pair those two blessings together. Being relieved and refreshed, we wash with a blessing in order to go about the rest of our spiritual and worldly obligations. But this is a topic we will discuss more in detail next time, when we discuss the blessing of Asher Yatzar. Answer: In order to remove an impure and unenlightened spirit of slumber. Question: How often do we need to wash in this manner? Answer: After every time we sleep we wash. Question: Do we wash with a blessing? Answer: When we arise we do not need to wash with a blessing. Question: What if there is no water for washing available? Answer: One should rub their hands together with a dry clean substance such as dirt or sand . 2 – This is in agreement with the Rashba (Rabbi Shlomo ben Aderet of 11th century Spain), vol. 1, §190, and §595. 3 – See Shulchan Aruch haRav 4:3, Rabbi Shneur Zalman of Liadi.